​Michele Nooteboom of Nuttree Studio is a South Australian artist residing in Adelaide. She has a penchant for all things bright & quirky.All her ceramic sculptural works are personally designed, handbuilt and painted and she believes each has it’s own personality (sometimes making them hard to part with). Out of the studio Michele, a former arts lecturer with TAFE SA, facilitates clay and drawing workshops as well as exhibiting. She won the major prize in the Brighton Jetty Classic Sculptures Exhibition 2009 with a very, very BIG ceramic babushka set painted in swimsuits. And why Nuttree? Well it’s the English translation of Michele’s Dutch surname of course. 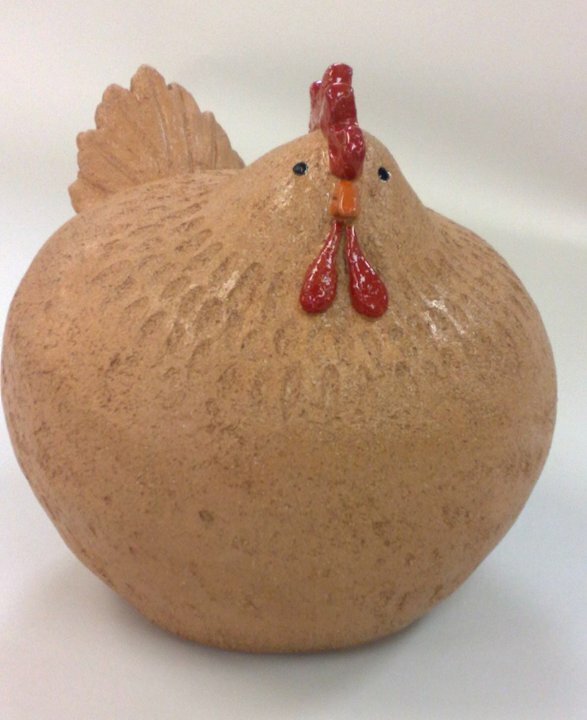 Chook - Handbuilt, feeneys buff clay, underglaze, glaze.